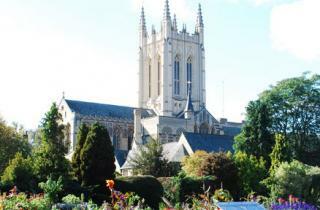 The annual Christmas Fair at St Edmundsbury Cathedral takes place on Friday 27 and Saturday 28 November, whilst Bury St Edmunds Christmas Fayre takes place all around it. Once again, the Cathedral will welcome supporters of EACH to a carol service on the opening day of the town’s Christmas Fayre, Thursday 26 November. At 6 pm a short carol service will take place with music and readings by local school children. All donations will go to the work of EACH. The usual Christmas Fair stalls will also be available including gifts, cakes, plants and paintings. Don’t miss the Grand Draw also with some great prizes to win such vouchers for £100, Theatre Royal tickets and a Family Photography session. Shoppers’ Carols will take place in the Cathedral at 12.30 pm and 2.30 pm on Friday and Saturday. Lasting just 25 minutes, this brief carol service serves as a reminder of what Christmas is all about. Visitors can enjoy refreshments in Pilgrims’ Kitchen, the Cathedral’s restaurant, which will be open from 8.30 am to 5.30 pm on Friday and Saturday and from 10.00 am to 3.30 pm on Sunday. The Cathedral Shop is open daily (Monday to Saturday 10 am to 5 pm and Sunday 11.30 am to 4 pm) and also stocks Christmas cards, decorations, Advent calendars and candles and a wide range of gift ideas. There will be a grand second hand book sale on Sunday 29 November from 11.30 am to 4 pm in the Edmund Gallery, facing Angel Hill. Our coffee is for the do'ers, the driven, the pioneers, the creators!